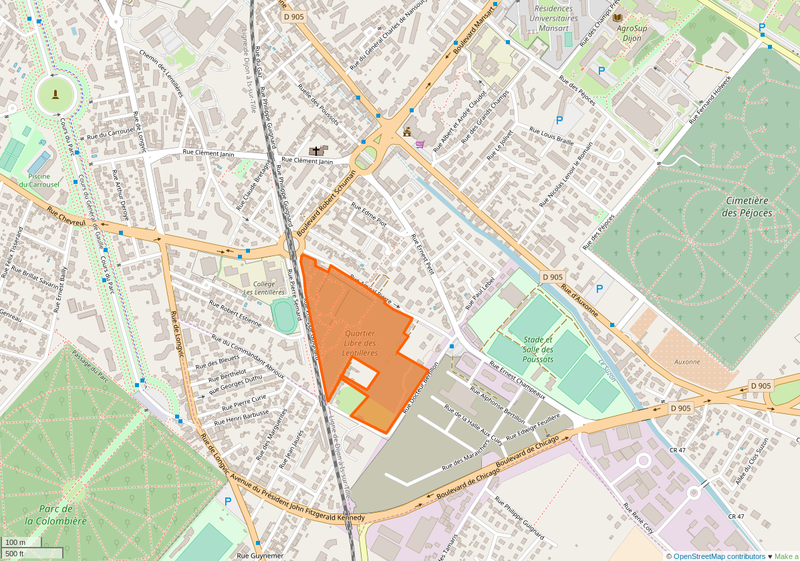 DIJON, France – Over a hundred anti-capitalists have created a nine hectare free district with urban gardens and a free market as they prevent development plans from being constructed. The occupiers are seeking to preserve agricultural land and experiment in collective living while demonstrating horizontal forms of community building. Presenters from the self-managed Quartier Libre des Lentillères, or Free District of Lentillères, spoke at the Athens Polytechnic University in early June 2018, for the second Networks of Resistance-European Local Struggles Conference. Dijon, the capital of France’s Golden Coast in the Burgundy region famous for wine and monasteries, is an area rich in history and home to 250,000 people. Presenters said that politicians and developers utilize the history to attract investment. The municipality has been busy with plans to modernize Dijon by building new streets, shopping centers, and installing thousands of CCTV cameras. Developers in Dijon now plan to build 15 new housing projects in what they call ‘eco-quarters’ by 2020. Recent history of anarcho-punk culture from 1980s-90s is also embedded in the city. Massive “anarcho-fun gigs” in the squatted industrial wastelands of Dijon took place in efforts to reclaim space from capitalism. The more accepting culture of squatting and land defense in France helped lead to the local, socialist-run government of Dijon essentially allowing anti-capitalists and anarchists to take the space they desired with no problems, the presenters said. The continued occupation of the land by over twelve collectives and more than 100 people living in the Lentillères are now threatened by the second phase of the encroaching ‘eco-quarters’ project. Slides of pictures of phase 1 of the eco-quarter shown during presentation. Three major agricultural projects are self-managed in the occupied space: the collective garden, the collective farm that grows produce for the free market, and private individual gardens. A garage, bike workshop, health and well-being space, sewing workshop, camping space, a hangar which hosts concerts, a free shop, a social space, and a summer market are among the ways occupiers are using the land. In the past eight years there have been various actions that have taken place to lead the gardeners to where they are right now. In the beginning of the occupation they didn’t know how to build structures but they started small and obtained knowledge to make their first cabins on the land, said the occupiers. A weekly free market was started after the destruction from the police raid on another squatted building named Les Trous in April 2012. The free market continues to grow and is operational during the growing season. Because of the stability established in 2012, occupiers started to build their own permanent structures out of recycled material. They started to move caravans into the quarters, transforming trucks into bathrooms, cabins, and also houses. Different traditions have been taking place over the last eight years and weekend party events during the spring and autumn. They throw collective work weeks where people gather and build different structures together. After failing in their attempted eviction of the feminist living space La Cyprine, the police have not made any evictions in the last two years. In the beginning, the presenter said that “it was a surprise for the town … they know when you are squatting a building and there is a trial and after they can destroy but for a garden, it was a bit new for them. How to evict a garden they didn’t know … they didn’t know how to react. At the same time they were not the owner at the beginning” so they couldn’t evict them. In April 2018, a week of resistance with skill shares, discussions, demos, and concerts took place in the Lentillères to focus plans on defending and securing their squatted free zone as the city continues to move forward with their plans of phase two of the eco-quarter. Check out their website to learn more about Lentillères. Stay tuned to Unicorn Riot as we will be publishing the other presentations from the Networks of Resistance II, as well as traveling to Greece to continue bringing our international coverage spotlighting sustainable ways of living, horizontal organizing, mutual aid, alternative economies, and more. Last year, activists from ZAD, Bure, Hambach, as well as the Cooperativa Integral of Catalonia and the DIY internet of ExarcheiaNet presented at the conference. The momentum of introducing new ideas, methods, and forms of struggle continued this year, as presenters came from Lentillères, the Heraklion Autonomous Market (an offshoot of Athens Integral Cooperative), the designer of a digital app for social currency, and Pablo Prieto (Prieto presented about Cooperativa Integral last year) who is currently in Kurdistan. This article was re-published on Love and Rage according to Creative Commons licensing guidelines.